The concept of forgetting the past and looking forward to what lies ahead sounds simple, but for many of us it’s something we simply aren’t able to do. Sometimes a little perspective helps. If we dig deeper into the history of the Book of Philippians we’ll find that we not only learn much from Paul, but we also learn much about him, and particular his character and humility. Paul penned the letter to the Philippians around A.D. 61 while imprisoned in Rome. Not only is Paul in prison, but each day he is living with the uncertainty of whether he will be released or executed. He’s also helpless to combat the efforts of his Jewish enemies who were trying to corrupt and destroy the very church that he himself had poured his life in to. Yet despite his circumstances, Paul continues to share a message of joy, and impresses upon the Philippians that joy does not depend on external circumstances, but rather is rooted in Jesus Christ. Paul goes on to use the word “joy” in this letter more times than any of his other writings in the New Testament. How was this possible? How was Paul able to overlook his circumstances? How was he able to press forward? Was he in denial? Not at all. Paul was well aware of his circumstances. Instead, Paul made the intentional choice not to complain, rather he relied on God, and chose to spend his time and energy sharing the Good News of Jesus Christ. Paul chose to be proactive, rather than reactive. It came down to one word: Trust. Paul trusted that God’s ways are higher than our ways and His thoughts higher than our thoughts (Isaiah 55:9). 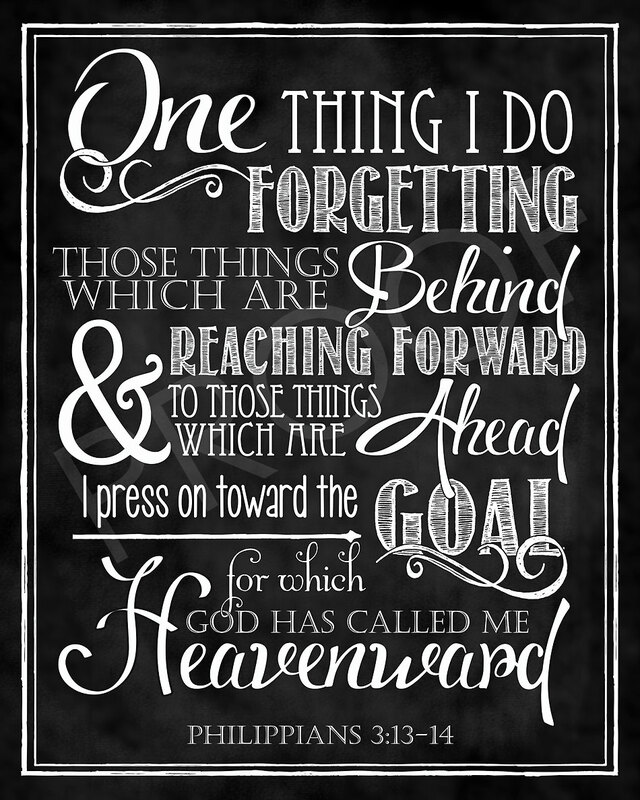 It’s important to clarify that by instructing us to forget the past and look forward to what lies ahead, Paul is not suggesting that we can forget the past altogether. In fact, often times it’s necessary to reflect in order to learn and grow. We remember the past. We reflect on the past. We learn from the past. We gain wisdom from the past. But we don't live in the past. We press forward and try not to make the same mistakes again. There’s always going to difficulties. We’ll inevitably experience setbacks, disappointments, and troubles along the way. But it’s in those troubles that we learn from both Paul and James that although we may not understand why it’s happening, we are to remain steadfast in our faith and obedience to God. We must press on, in faith, and trust God to be God, and allow His Will to be done in our lives – every day – and in every decision. Like the Apostle Paul, we must make an intentional choice. Will we choose to dwell on the past and let our circumstances weaken and potentially sever our relationship with God? Or like Paul, will we show complete trust and reliance on God, and allow a deep-rooted faith in Jesus Christ to allow us to press forward? Paul trusted that the Lord stands firm on His plans to give us a future and a hope (Jeremiah 29:11). Jesus tells us in John 8:31 that “You are truly my disciples if you remain faithful to my teachings.” Since faith comes by hearing, and hearing by the Word of God (Romans 10:17), and since God’s Word is a lamp to guide our feet and a light for our path (Psalm 119:105), the key to pressing forward and enduring the many trials and tribulations of life is immersing ourselves in God’s Word. In Scripture, we find more than just words. We find the living water that is necessary to refresh and restore our strength, and our soul, so that when troubles come, we’ll remain content and consider it pure joy, so when we’ve fully pressed forward and reached the end of the race, we’ll have drawn closer to God, reached a higher level of spiritual maturity, and received the heavenly prize for which God, through Christ Jesus, is calling us.